Rose Red Metal flake available in 3 Sizes: Micro .004″, Mini .008″ , and Bass Boat .015″ Available in 4 fl. oz. Jars or 1 lb. Bags. 400 degree temperature threshold. These Metal Flakes work with any base clear, blender or binder for a fantastic paint job! Try these in Epoxy, resin, glycerin, wax, polish and sealer. These flake work in virtually ANY clear! Our Rose Red Metal Flake additives are very versatile and can be used in so many applications. 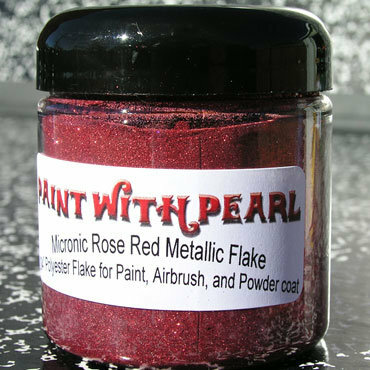 Our Rose Red Metal Flake is available in many sizes and colors. We now offer all sizes of flakes in many of our popular colors. We personally like the small flakes, because of the ease of use, but there are a lot of people out there who want larger metal flakes, so we are giving them to you. 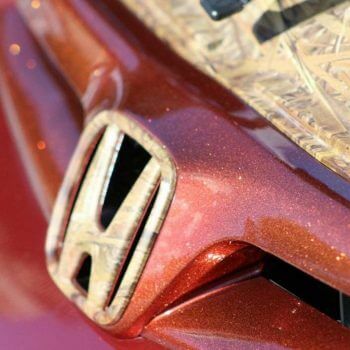 Creating a great Rose Red metal flake paint job is super simple with our flakes. Just choose your base coat (black is good if you want the paint to take on the color of the flakes), and add a heaping tablespoon of our flake to any clear coat (although we recommend a base clear for mixing the flake into, like PPG’s DBC-500, or HOK’s inter coat clear). Visit our FAQ page for more answers to your questions, or contact us, we are always ready to answer questions. We recommend as a starting ratio 1 heaping tablespoon per sprayable quart of clear paint/binder or clear powder for powder coating our Rose Red Metal Flake. We at Paint With Pearl appreciate all of our customers! Especially those who take the time to send us pictures and feedback on all of our products. Our Candy Pearls, Metal Flakes, True Chameleon pigments, Thermochromics, Glow In The Darks and all other paint pigments are truly custom paints and can be used in almost any application. There are so many options with our products! Photos, Videos and testimonials are a great way to show off the capabilities of our additives. If you find the opportunity, send us some great pics and a small testimonial about what you did with our products . We will send you a gift card for the website. We love to show off the work that our wonderful customers are doing. Contact us and send us your work! Check out our products on Amazon Prime! We are also accepting payment through Amazon! 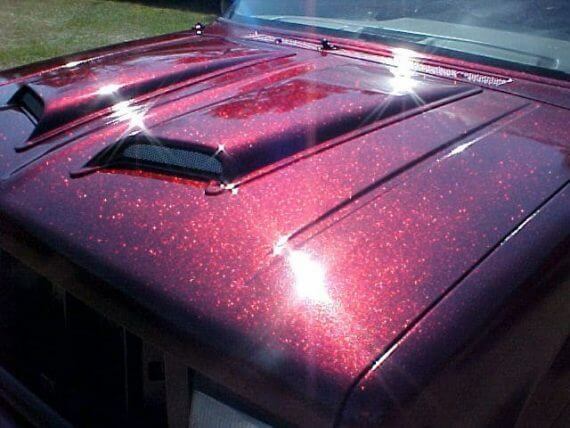 Rose Red Metal Flake comes in many sizes, including .004″, .008″, .015″. It has a 400 degree temperature threshold. Is for paint, powder coat, anything.